Using contrasting colors makes some of the most striking and exciting color pallets. 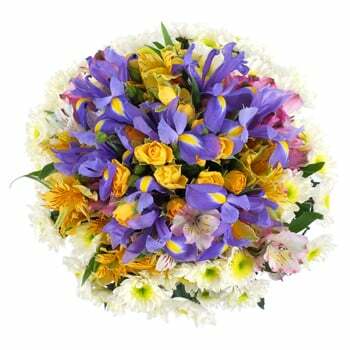 Our experts have put together a bouquet with a color variety that is sure to impress. Your recipient will receive white spray Chrysanthemums, yellow, pink, and white Alstroemeria, blue Irises, and more. Send your best wishes, say Happy Birthday, or decorate your desk with Contrasting Colors.